Doug O’Neill, the 44-year-old Californian Irish American, will be looking to take the next step into the history books on Saturday when his colt, I’ll Have Another, steps into the starting stalls for the Preakness the second leg of the Triple Crown. Despite winning the Kentucky Derby I’ll Have Another will not even start favorite for the Pimlico classic, which will be shown live on NBC. That honor goes to Bodemeister who came second in the Derby but was compromised by a poor ride by jockey Mike Smith who went off like the hammers from hell and went too fast to last all the way on the lead. The general belief is that Bodemeister will set a slower pace on Saturday and that will help him last. But Pimlico is a much deeper track than Churchhill Downs which may not suit Bodemeister quite as much. In addition he has far fewer runs and less experience than I’ll Have Another and may be feeling the effects of his hectic Derby pace. A well priced outsider is Went the Day Well, the horse bred by New York Irish lawyer JP Delaney and ridden by John Velasquez who is son in law of Irish trainer Leo O’Brien. Went the Day Well was hampered and came running late in the Derby and will be hoping for a better trip on Saturday. I think I’ll Have Another will defy the favorite backers and confirm his form at Kentucky and defeat Bodemeister. I expect Went the Day Well to be second and Bodemeister to finish third. Pick creative Cause fifth at Churchhill Downs for fourth. 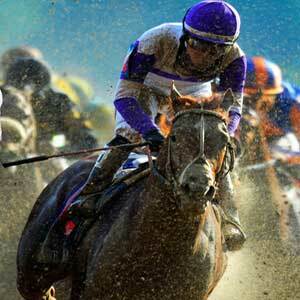 The one angle that works most years is that Kentucky Derby form holds up remarkably well at the Preakness. Given that sticking with those who want well at Kentucky on Derby Day can pay off with a nice dividend.